After this post appeared, the Telegraph changed the headline from “Russia raises tension…” to “Russia threatens US …” The author is a research fellow at Oxford University. 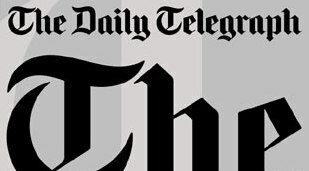 Every now and again I buy an actual paper copy of your newspaper, The Telegraph, usually for the Sudoku. But buried deep inside yesterday’s print edition (on page 14), I found this Orwellian headline: “Russia raises tension as US upgrades nuclear arsenal in Europe”. Bizarrely unworthy of front page news, although you’d think it might be… after all, your readers would want to know when the Americans pile more weapons into Europe, since those of us living here will be the ones on the receiving end of retaliatory strikes. And then there’s that nagging cognitive dissonance again between your headline and your content: although it’s the US that’s increasing its nuclear arsenal in Germany, it’s Russia that’s raising the tensions… odd, to say the least. How is Russia raising the tension, a reader might plausibly ask? Ah… Russia’s thinking of counter-measures to restore the strategic balance on its own borders. We are told – by your journalist Roland Oliphant, and without a hint of irony – that the current deployment of American nuclear weapons “is subject to secrecy” and that a Pentagon source would not reveal “the specifics of which weapons were located where” in Germany. End of story. In other words, no point in your readers expecting Oliphant might for once do his job, ask some probing questions and investigate. He doesn’t even tell us that maybe, just maybe, this American move is in violation of the Nuclear Non-Proliferation Treaty (Articles 1 & 2), a pillar of international law in nuclear non-proliferation and disarmament efforts and signed by both the US and Russia (USSR) back in the day. It certainly goes against a March 2010 decision by the German Bundestag, by a large majority, to demand that the US remove their offensive tactical nuclear capability from German soil. Let’s all stop pretending that Germany is actually a sovereign country within the EU. In fact, Washington timed the Volkswagen scandal perfectly this week, right after Merkel publicly suggested the West should probably start talking to Assad and the Russians to help resolve the Syrian crisis. Germany remains an occupied country, a puppet state, 70 years after WW2, with no say over its foreign policy. It’s time the Germans wake up and put on their Lederhosen… they are on the front line again. Reports that America is upgrading its nuclear arsenal in Germany prompts threat of retaliation. Russia has threatened to take “countermeasures” if the United States goes ahead with the deployment of a new type of nuclear weapon to bases in Germany, raising fears of a return to a Cold War style arms race in Europe. The Kremlin said plans reported by German media for the US to upgrade its nuclear weapons arsenal in the country would be “a serious step towards raising tension” in Europe. “Unfortunately, in the case of these plans – and we can say with certainty that they are moving towards realisation – this can lead to a violation of the strategic balance in Europe,” said Dmitry Peskov, Vladimir Putin’s spokesman. “Therefore, of course, that would require Russia to take counter-steps and countermeasures to restore balance and parity,” he added. The new escalation in the war of words between Moscow and Washington follows President Vladimir Putin’s latest intervention in the war in Syria, which the US describes as “unhelpful”. Syria confirmed that Russian drones were used in military operations for the first time. The Syrian army yesterday launched an offensive to relieve a siege by Islamic State of Iraq and the Levant (Isil) on a regime air base east of Aleppo. The deployment of US nuclear weapons in Europe is subject to secrecy, but details appear to have been leaked in recent weeks. The US is planning to replace 20 nuclear weapons deployed at Büchel airbase in western Germany with a more modern variant, according to details first reported by ZDF television. According to the reports, the current B61 bombs are to be replaced with B61-12s, a newer version of the weapon which is more accurate and less destructive. The new variants can also be fired as missiles, while the older version had to be dropped from aircraft. That has led to fears governments may be less cautious about using it. The Kremlin did not say what form the threatened countermeasures might take, but one source said a possible option would be the deployment of nuclear-capable Iskander missiles to Kaliningrad, Russia’s exclave on the Baltic Sea which borders Poland and Lithuania. “The question is being considered. A final decision will be taken after detailed analysis of the potential threat from German Tornado fighter-bombers carrying new B-61-12 atomic bombs,” a military source told Interfax, a Russian news agency. Russian concerns appear to centre on the fact the newer version of the bomb is considered more appropriate for tactical use. The country’s foreign ministry said that it wants a ban on deployment of non-strategic nuclear weapons outside the national territory of the country that owns them. “With the new bombs the boundaries blur between tactical and strategic nuclear weapons,” Hans Kirstensen of the Nuclear Information Project in Washington told ZDF. A Pentagon spokesman said it would not comment on the specifics of which weapons were located where, and that there was no change to the US nuclear “posture”. The United States has reduced its non-strategic nuclear weapons by approximately 90% since the end of the Cold War,” the spokesman, Lt. Col. Joe Sowers, said. “Remaining Russian weapons greatly exceed those retained by the United States.